Euro bergerak dekat tingginya 3 minggu hari Rabu menjelang pertemuan kebijakan Federal Reserve AS. Indeks Nikkei menguat 1% untuk menutup kejatuhan selama 4 hari berturut-turut, terangkat kuatnya earnings korporasi AS dan melemahnya Yen. KOSPI menghapus penguatan awal untuk berakhir nyaris flat, terbebani kekhawatiran krisis hutang Eropa. Hang seng ditutup menguat tipis berkat saham-saham properti dan keuangan. IHSG ditutup melemah tipis 6.710 poin akibat saham-saham sektor keuangan dan pertambangan. Komoditi Emas merosot sebesar 1,3% ke level $1778.75/roy ounce pada perdagangan Kamis dini hari setelah langkah The Fed mengecewakan pelaku pasar yang mengharapkan bank sentral tersebut akan menerapkan paket stimulus keuangan yang lebih kuat lagi. Penurunan Emas juga dipicu oleh menguatnya dollar AS terhadap mata uang utama lain. Pada sidang FOMC Kamis dini hari The Fed mempertahankan suku bunga dilevel terendahnya sebesar 0,25% dan menyatakan pertumbuhan ekonomi masih “sangat lambat”, The Fed menempuh langkah yang sebelumnya pernah dilakukan pada 1961 lalu yang disebut dengan pembelian obgliasi “operation twist”, dimana bank sentral akan menjual obligasi bertenor lebih pendek untuk membeli obligasi dengan tenor panjang senilai $400 M pada Juni 2012 mendatang. Sterling melemah terhadap US dolar pada perdagangan di hari Rabu Sterling merosot hingga ke level terendah 8 bulan terahadap US Dolar dan menyentuh level terendah 2.5 tahun terhadap Yen kemarin, setelah BoE mengindikasikan meningkatnya peluang bagi bank sentral untuk segera meluncurkan Quantitative Easing lanjutan. Meskipun Adam Posen masih tetap menjadi satu – satunya anggota MPC yang menyuarakan penambahan 50 M Poundsterling dalam program pembelian aset bank sentral. Suramnya data ekonomi dan hasil survei dalam beberapa minggu terkahir telah memicu kekhawatiran terhadap prospek ekonomi Inggris ditengah berlangsungnya langkah – langkah penghematan yang ekstrim, disamping itu perekonomian Inggris juga dinilai sangat rentan terkena dampak krisis hutang kawasan zona Eropa. Pada perdagangan di hari Rabu Indeks Berjangka Nikkei menguat tipis diperkuat oleh short covering menyusul kenaikan saham – saham Asia dan menjelang rilis keputusan kebijakan The Fed, tetapi volume perdagangan yang rendah mengindikasikan kurangnya minat kuat investor, banyak yang masih sangat khawatir terhadap bagaimana Eropa dapat mempertahankan diri dari krisis hutang yang semakin berat. Bukannya pembelian Obligasi tahap ke III atau QE III yang di duga banyak analis mungkin yang dipilih The Fed untuk Operation Twist, dimana The Fed akan menggantikan Obligasi jangka pendek dengan Obligasi jangka panjang atau secara aktif menjual aset jangka pendek untuk Obligasi jangka panjang bertujuan untuk semakin menurunkan suku bunga jangka panjang. With the last full week of July ahead, there is significantly more event risk on the docket than the third week in July. 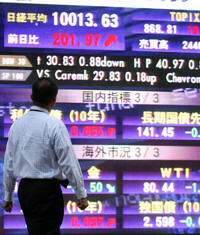 Now, as the markets have begun to digest the results of the new bailout of Greece, price action will largely be dictated by key events on the docket, including American and British growth figures, Australian and German consumer price indexes, and a rate decision from the most southern antipodean nation. Still, the markets will continue to listen to jabbering between Democrats and Republicans, as the debt ceiling debacle has still yet to find resolution ahead of the ‘hard’ August 2 deadline. The British economy has experienced growth of at least 1.5 percentin each of the past four quarters, on a year-over-year basis, going back to the second quarter of 2010. Surveys indicate that the GDP growth figure released on July 26 will come in at 0.8 percent, well below last quarter’s 1.6 percent pace, on a yearly-basis. Growth forecasts have been revised downwards as the economy has failed to pick up momentum in recent weeks and months, as most recently noted by the Bank of England minutes, released this past week. Contributing to the downturn has been the persistent Euro-zone debt crisis, which has curtailed investment overseas and demand for British goods. Inflation continues to be stubbornly high at 4.5 percent, more than double the inflation target rate as set by the Bank of England. 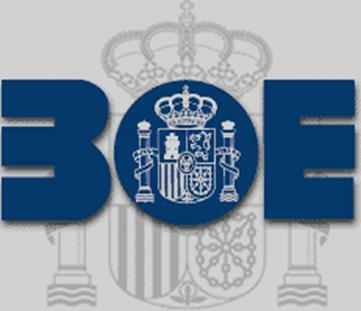 Although a decline in output should deter further inflation, the priority remains to accelerate economic growth, which is why the central bank has held rates at 0.50 percent for twenty-nice consecutive months. U.S. Durable Goods Orders are expected to have risen only 0.3 percent after increasing a promising 2.1 percent in May, already revised up from the 1.9 percent initial reading. The increase is still welcomed following a 2.7 percent drop in orders in April. The recent upswing in the closely watched economic indicator is rooted mainly in easing disruptions to factory production in the United States, as supply chain disruptions as a result of the aftermath of the Japanese natural disasters and ensuing earthquake weakened demand. In the fragile U.S. economy, manufacturing has been one of the key areas of strength since the recession abated. A weaker domestic currency has boosted exports and encouraged manufacturers to continue to make long-term investments. 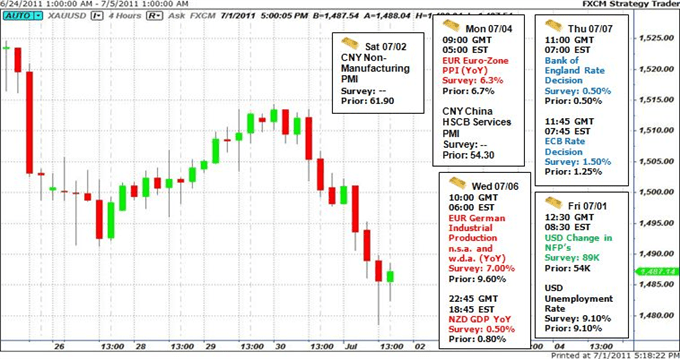 The durable goods orders report is a leading indicator of economic health, and will thus be closely watched to gauge manufacturers’ sentiment and investment activity as the debt ceiling debate looms in the U.S.
At its last meeting on June 8, the Reserve Bank of New Zealand decided to maintain its key benchmark interest rate at 2.50 percent, on the outlook that the economy is steadily improving following the earthquakes over the past few months. The central bank has determined that the most southern antipodean nation is still in need of stimulus to promote further strengthening. It is widely expected that the key rate will be kept at 2.50 percent at the next monetary policy meeting on July 28, with the Credit Suisse Overnight Index Swaps showing a mere 6.0 percent chance of a 25.0-basis point rate hike. 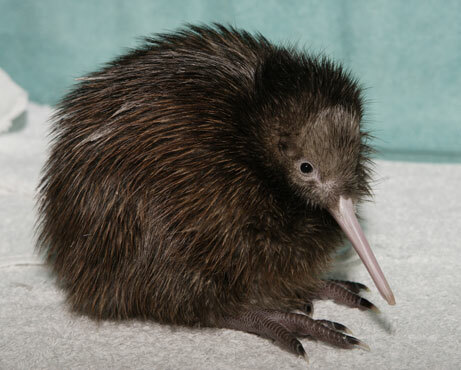 Still, despite such weak expectations, the number of basis points priced into the Kiwi over the next 12-months, 94.0, has boosted the New Zealand Dollar since mid-March. In spite of such a strong domestic currency, recent data releases indicate that the economy is undergoing robust growth and inflation has risen faster than expected. GDP growth figures released on July 13 came in at 1.4 percent, blowing past a forecast of 0.5 percent growth, while recent inflationary data showed inflation increasing to 5.3 percent, topping expectations of 5.1 percent, on a year-over-year basis. These two important economic indicators will play a major role in determining future the central bank’s cash rate decisions. If the recent growth continues, there is a high probability that there will be a rate hike in September to contain inflationary pressures. The German consumer price index has remained steady for the last six months and no change is expected in this figure at the next release next Thursday. According to a Bloomberg News survey, the initial forecast calls for a print of 2.3 percent on a year-over-year basis, matching the number of the previous month. This number is slightly higher than the European Central Bank’s target inflation of “below but close to 2 percent,” but the recent rate hikes enacted by the central bank are expected to help suppress further jumps in inflationary pressures: changes in interest rates take anywhere from two- to six-months to be felt by an economy. 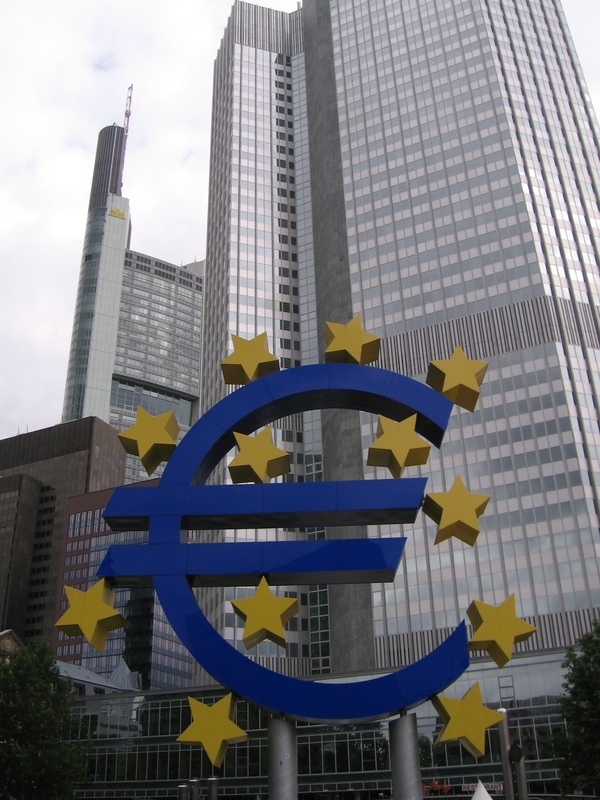 Higher energy prices have been the primary driver keeping inflation above the 2.0 percent mark but “lower food and seasonal food prices can be in part held responsible for the benign pan-German reading.” Since Germany is the Euro-zone’s strongest and largest economy, this reading is closely watched by the European Central Bank as a determinant of their monetary policy decisions. The U.S. economy is expected to have experienced very slow economic growth in the second quarter of 2011. The GDP data that will be released on July 29 is an indication that output is increasing at a decreasing rate, albeit at a decreasing rate. Forecasts call for a 1.7 percent growth in output versus a 1.9 percent growth experienced in the first quarter, according to a Bloomberg News survey. Two significant factors contributing to the slow recovery include high food and energy prices and supply chain disruptions following the Japan earthquake. The ongoing debt ceiling debate has reduced consumer confidence as investors concerns grow about the possibility of a U.S. default. The lowered confidence levels have translated into reduced spending impacting the output produced by the world’s largest economy. At the most recent Federal Reserve monetary policy meeting, the FOMC revised GDP and unemployment forecasts downwards from their April projections. The change in growth forecasts for 2011 and 2012 have been revised from 3.3 percent to 2.9 percent and from 4.2 percent to 3.7 percent, respectively. Dollar New Zealand bertahan dekat puncaknya 30 tahun terhadap dollar AS seiring minat resiko membaik setelah rilis data employment sektor swasta AS. Indeks Nikkei rata-rata meraih puncak 4 bulannya, dipimpin penguatan sektor konstruksi setelah upgrade rating dari Deutsche Securities menjadi “overweight”, sebelumnya “market weight”. Bursa Seoul ditutup nyaris flat mengikuti penguatan 7 sesi berturut-turut walau adanya data jobs dan retail yang positif, yang akhirnya tertekan oleh aksi profit-taking. Hang Seng berakhir menguat terkait kenaikan sektor properti dan keuangan di bursa Shanghai yang membantu mengangkat indeks. IHSG ditutup naik 64,218 poin berkat aksi beli asing terhadap saham-saham bluechip. Euro dan mata uang ber-yield lebih tinggi diperdagangkan menguat pada Selasa, seiring pulihnya risk appetite pasca serangkaian data China mampu meredakan kecemasan melambatnya pertumbuhan global, begitu juga kenaikan persyaratan cadangan perbankan China. Meskipun begitu, trader menilai euro tetap berpotensi didera sell on rallies mengingat masih adanya kecemasan krisis hutang Yunani dan ketidakpastian rencana keterlibatan sektor swasta. Inflasi Cina melambung ke level tertinggi dalam 34 bulan, dan langkah bank sentral China menaikkan persyaratan cadangan bank sebesar 50 basis poin, menurut analis merupakan sebuah skenario dari pemerintah China dalam meredam laju ekonomi secara perlahan. Hal tersebut dapat mengangkat sentimen terhadap resiko dalam jangka pendek, yang ditunjukkan dengan kenaikan solid pada saham-saham Eropa dan AS. Pada hari yang sama, menteri keuangan zona Euro berdiskusi guna membahas bagaimana keterlibatan investor swasta pemegang obligasi Yunani dalam paket pinjaman ke-2 untuk Yunani menjelang batas waktu kesepakatan pada 20 Juni mendatang. Sterling menguat versus Dollar AS yang tengah berjuang untuk pulih di hari Selasa, namun apresiasi sterling justru memperbesar resiko terjadinya aksi jual mengingat data inflasi Inggris mengikis kepercayaan investor akan adanya kenaikan suku bunga oleh Bank of England dalam waktu dekat. Inflasi tingkat konsumen di Inggris tumbuh dengan laju 4,5% pada tingkat tahunan di bulan Mei, bertahan di level tinggi 2½- tahun dan jauh lebih tinggi dari target BoE pada 2%. Namun para analis menilai jika angka tersebut belum cukup untuk mendesak BoE menaikkan suku bunga dari rekor rendah 0,5% dalam beberapa bulan ke depan, meski BoE berulang kali memperingatkan adanya resiko inflasi dapat mencapai 5% sebelum kembali mereda. Posisi Sterling akan semakin tertekan untuk beberapa bulan kedepan, seiring bank-bank sentral besar seperti European Central Bank diprediksi akan kembali menaikkan suku bunganya, sementara QE2 Fed akan segera berakhir. Dollar AS berbalik menekan Yen Jepang dan memangkas penurunan terhadap sebagian besar mata uang lainnya pada hari Selasa pasca terjadi lonjakan pada data inflasi AS dan penurunan angka penjualan ritel AS yang kurang dari perkiraan. Data menunjukkan kenaikan terbesar sejak 2008 pada harga produsen tahunan AS, mengangkat yield obligasi dan menambah daya tarik Greenback. Euro dan mata uang ber-yield tinggi lainnya yang sempat menguat pada awal sesi harus melepas gain terhadap dollar pasca data dirilis. riset pada GFT Forex di New York. Penjualan Ritel AS pada bulan Mei merosot untuk pertama kalinya dalam 11 bulan terakhir akibat penerimaan dealer mobil yang turun tajam. Namun penurunan penjualan ritel itu masih lebih sedikit dibandingkan estimasi. Sementara Inflasi Harga Produsen AS untuk tingkat tahunan melonjak jauh di atas ekspektasi. “Data seimbang dan layak, sehingga mendorong yield naik dan diikuti oleh Dollar terhadap Yen,” kata Omer Esiner, kepala analis pasar Commonwealth Foreign Exchange di Washington. Euro and the currency had traded higher yields rose on Tuesday, as the recovery in risk appetite of China’s post-series data can relieve anxiety slowing global growth, as well as the increase in China’s banking reserve requirements. Even so, traders assess the euro still has the potential to sell on rallies suffered due to the presence of anxiety and uncertainty Greek debt crisis plan for private sector involvement. Chinese inflation soared to its highest level in 34 months, and the steps China’s central bank raised bank reserve requirements by 50 basis points, according to analysts is a scenario of the Chinese government in reducing the rate of the economy gradually. 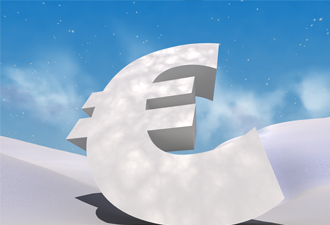 It can lift sentiment toward risk in the short term, as indicated by a solid rise in European stocks and U.S.. On the same day, discussing the Euro zone finance ministers to discuss how the involvement of private investors in the Greek bondholders 2nd loan package to Greece before the time limit agreed on 20 June. Sterling strengthened versus the U.S. dollar is struggling to recover on Tuesday, but the appreciation of sterling would increase the risk of indiscriminate selling as data for UK inflation will erode investor confidence in the existence of interest rate hikes by the Bank of England in the near future. UK consumer inflation rate grew at a rate of 4.5% at an annual rate in May, remained at a high level of 2 ½ – year and much higher than the BoE target at 2%. 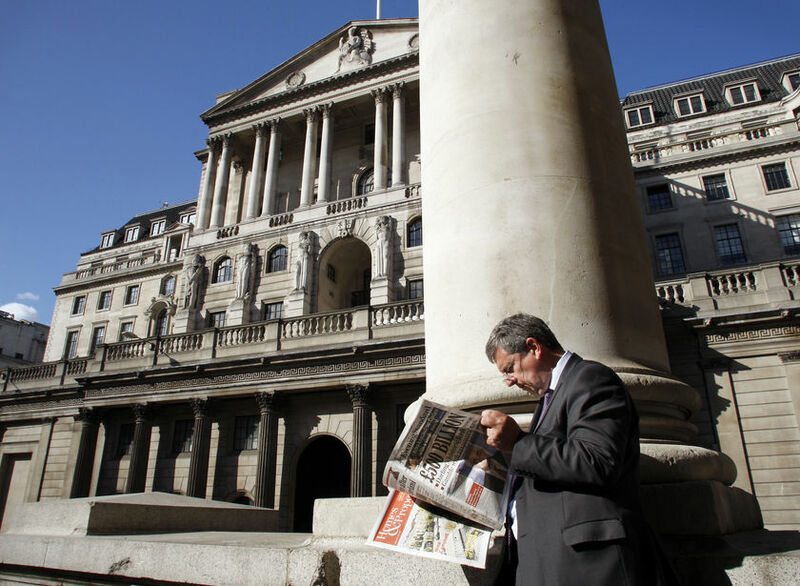 But analysts assess if the number is not enough to urge the BoE to raise interest rates from a record low 0.5% in the months ahead, although the BoE has repeatedly warned of the risk of inflation could reach 5% before returning to subside. Sterling will be increasingly depressed position for a few months ahead, as the major central banks like the European Central Bank is expected to again raise interest rates, while the QE2 Fed will soon end. U.S. Dollar Japanese Yen turned press and trim decline against most other currencies on Tuesday after going spike in U.S. inflation data and the decline in U.S. retail sales figures are less than expected. Data showed the largest increase since 2008 in the annual U.S. producer price, lifting bond yield and add interest greenback. 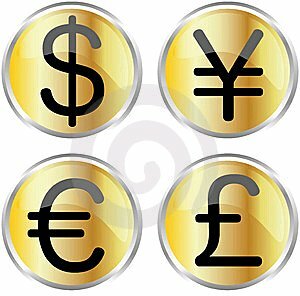 Euro and currencies were other high yield which was strengthened in the early session gains against the dollar should be released after the data was released. research at GFT Forex in New York. U.S. Retail Sales in May declined for the first time in 11 months from receipt of car dealerships fell sharply. But the decline in retail sales was still less than the estimate. While the U.S. Producer Price Inflation to an annual rate soared far above expectations. “Data balanced and reasonable, thus pushing the yield up and followed by the dollar against the yen,” said Omer Esiner, chief market analyst at Commonwealth Foreign Exchange in Washington. Bank of England seharusnya menaikkan suku bunga saat ini untuk mencegah pengetatan yang lebih agresif di waktu mendatang dan membantah spekulasi bahwa bank sentral telah melepas mandat untuk melawan inflasi, menurut Martin Weale, salah satu pejabat BoE. Weale, yang telah menyerukan kenaikan sebesar 25 basis poin sejak bulan Januari, mengatakan kenaikan suku bunga lebih awal dapat memperburuk perekonomian namun bank sentral akan mendapatkan kelegaan untuk memperlambat atau bahkan membalikkan proses pengetatan nantinya jika dibutuhkan. Kenaikan lebih awal berarti suku bunga tidak harus naik sesuai perkiraan pasar saat ini untuk beberapa tahun kedepan, ucap Weale pada Finance Director‘s Strategy Meeting di London. “Apa yang akan dilakukan adalah mengurangi spekulasi bahwa bank sentral ingkar terhadap mandat inflasinya,” ucap Weale. “Ini akan mengurangi resiko kenaikan berikutnya dan mungkin dapat berarti bahwa dalam waktu 3 tahun kedepan, kebijakan moneter tidak perlu seketat yang ditunjukkan kurva yield,” ucapnya. Emas anjlok sebesar 1% hari Senin, seiring melemahnya minyak dan komoditas lainnya ditengah kecemasan pertumbuhan ekonomi dan krisis hutang Eropa memicu aksi jual sektor komoditas. Perak juga turun sebanyak 4%, seiring absennya aksi beli safehaven kendati downgrade pada peringkat hutang Yunani. Emas mendapat tekanan dari likuidasi aset beresiko dan akan menghadapi tekanan dari aksi profit-taking, namun sektor fundamental masih mendukung emas,” ucap Sean McGillivray, kepala alokasi aset Great Pacific Wealth Management. Aksi juall teknikal juga turut menekan harga setelah emas menembus ke bawah MA20, level yang menahan selama 3 pekan terakhir. Emas nampaknya sedang menuju level support setelah terpantul dari levl MA20 pada $1,507 per ons. Minyak Brent beranjak ke area negatif dan minyak mentah AS menambah penurunan pada hari Senin setelah pemangkasan peringkat hutang Yunani menambah kecemasan mengenai perkeonomian dan tingkat permintaan minyak. Standard & Poor’s Ratings Services menurunkan peringkat hutang jangka panjang Yunani dengan outlook negatif, membuat busa saham AS tertekan turun dan euro memangkas kenaikan terhadap dollar. “Downgrade Yunani oleh S&P memicu koreksi dan bursa saham juga melemah,” ucap Chris Dillman, analis pada Tradition Energy di Stamford, Connecticut. Kecemasan melambatnya pertumbuhan ekonomi telah menekan minyak mentah AS sebelum berita Yunani dirilis. Tingginya persediaan domestik, terutama di Cushing, Oklahoma, juga turut menekan harga minyak. Katalis segar datang di hari Senin ketika Royal Dutch Shell menyatakan force majeure pada pengiriman minyak mentah Nigerian Bonny Light untuk bulan Juni dan Juli. Shell mengatakan turunnya produksi diakibatkan kebocoran dan kebakaran pada jalur pipa Trans-Niger. Bank of England should raise interest rates today to prevent a more aggressive tightening in the future, and denied speculation that the central bank has released a mandate to fight inflation, according to Martin Weale, one of the BoE officials. Weale, who has called for an increase of 25 basis points since January, said an early rate hike could worsen the economy but central banks will get relief to slow or even reverse the process of tightening later on if needed. The increase means the interest rates sooner not have to go up according to current market estimates for the next few years, Weale said the Finance Director’s Strategy Meeting in London. “What will be done is to reduce speculation that the central bank’s mandate of breach against inflation,” said Weale. “This will reduce the risk of subsequent increases and may mean that within 3 years, monetary policy does not need as tight as indicated yield curve,” he said. Gold fell 1% Monday, as weaker oil and other commodities amid worries of economic growth and European debt crisis triggered a sell-commodity sectors. Silver also fell by 4%, in line despite the absence of buying safehaven downgrade the debt ratings of Greece. Gold under pressure from the liquidation of assets at risk and will face pressure from profit-taking action, but the fundamentals still support the gold sector, “said Sean McGillivray, head of asset allocation Great Pacific Wealth Management. Action technical juall also suppress the gold price after penetrating downward MA20 , a level that held for 3 weeks. Gold seemingly heading for the level of support after reflected from levl MA20 at $ 1.507 per ounce. Brent oil went into the negative area and increase the decline in U.S. crude oil on Monday after cutting debt ratings Greek add perkeonomian and level of anxiety about oil demand. Standard & Poor’s Ratings Services lowered the long-term debt ratings with a negative outlook Greece, foaming depressed U.S. stock cut down and the euro rise against the dollar. “Greece Downgrade by S & P trigger a stock market correction and also weakening,” said Chris Dillman, an analyst at Tradition Energy in Stamford, Connecticut. Fears of economic slowdown has hit the U.S. crude oil before the Greek news release. High domestic inventories, particularly in Cushing, Oklahoma, also weighed on oil prices. Fresh catalyst came on Monday when Royal Dutch Shell declared force majeure on oil shipments Nigerian Bonny Light crude for June and July. Shell said the decline in production caused by leaks and fires on the Trans-Niger pipeline.